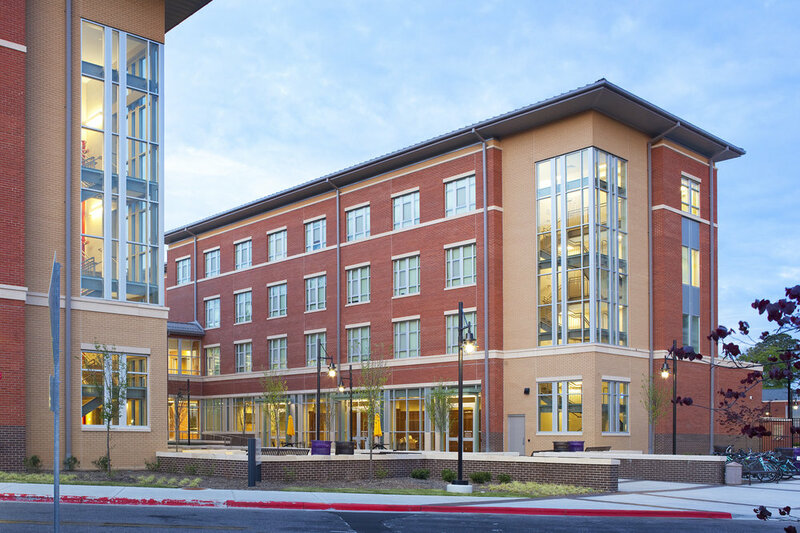 The new Gateway Residence Hall embraces the planning principles of an on-campus living and learning community through the guidelines established by the East Carolina University Comprehensive Facilities Master Plan. Davis Kane was retained to provide design and construction administration services from Design Development through Close Out of the project. The Residence Hall includes abatement and demolition of the existing Belk Dormitory and construction of the new 208,000 sf residence hall complex with 724 traditional and semi-suite student beds and 4 staff apartments on the same site. Also included is 7,750 sf of multi-purpose space. The buildings mirror each other along a large pedestrian plaza creating a gateway and gathering area between the ECU Dowdy-Ficklen Stadium and the College Hill housing neighborhood. A Recreation Plaza included in the complex provides a student life activity destination for residents at College Hill Community. Private courtyards as also included at both buildings and the ballroom.